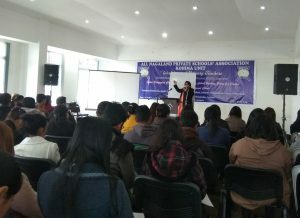 Angela Ghosh speaks at the ANPSA-organised workshop in Kohima, on Saturday. The president of the ANSPA unit, PJ Nathan said that the workshop was conducted with a view to providing education of high standard to teachers in accordance with the Right to Education Act’s inclusive learning nature. Also, the joint director of the State Council of Educational Research and Training, NC Kikon, who attended the event as the special guest said: “Primary stage is the most important structure” among all the educational levels. With primary teachers having the need to shoulder “bigger responsibilities and bigger roles” in the 21st century, Kikon pointed out that it would be ‘unnatural to think that a teacher without professionalism is weak.’ She urged the participants to build other aspects of education besides the classroom teaching-learning environment. It is vital to nurturing “first-time learners” in education, the official said. The topics are the key components in acquiring professionalism; professional developing for teachers at all levels; and inclusive learning, which, are required to establish a solid foundation, Kikon said. Asserting that life skills are of paramount importance, the joint director encouraged the teachers to acquire “vast knowledge beyond textbooks,” and that they should be able to do that as teachers. Unlike the traditional process of learning, there are a lot of innovative and inclusive educational programmes for teachers in the present generation. The teachers should be up-to-date with such programmes, as it is taking a very important place in the education system, Kikon added. She maintained that children these days are “super-smart,” and teachers should become “valuable affective teachers” to them. Students should also be “emotionally stable, socially fit, psychologically balanced, and environmentally safe and sound,” Kikon said. The principal of Union Chapel School at Kolkata, and consultant at Harper Collins India, Angela Ghosh, was one of the resource persons during the workshop. She spoke about the significance of understanding the psychological aspects of a child as well as the requirements to handle them. She felt that the primary stage was an ‘age of tremendous potential where teachers have to draw that out. In fact, the one special quality in a child during this period is “curiosity,” which is also the key ingredient to learning. Teachers should be equipped to answer all the questions, she said. According to the principal, “No question is silly” as it tends to their need. Silencing the students’ voice will do more harm than good in their life, she reminded. ‘We (teachers) are their role models and they treat us like gods; and if we don’t love them back they are going to hate schools for the rest of their life,’ she said. Speaking from her 41 years of teaching experience, Ghosh instructed the participants to appreciate students for their efforts, be it small or big. “Every effort has to be acknowledged,” she iterated. She encouraged the parents, too, to acknowledge that “little hero” in their child instead of focussing on the negative aspects. The speaker expressed belief that “everything can be confronted with love.” She urged the teachers to be a “facilitator of love” rather than being just a teacher within the four walls of the classroom. In the second session, Naomi Ltu, head teacher at Jo Foundation in Kohima, was the resource person. She spoke about the topic ‘teaching children with special needs’ during the event.